In common with much of the rest of the country, we’ve had a burst of proper wintry weather for the past few days: snow, sleet, hail, high winds and rain, usually all within the space of an hour. 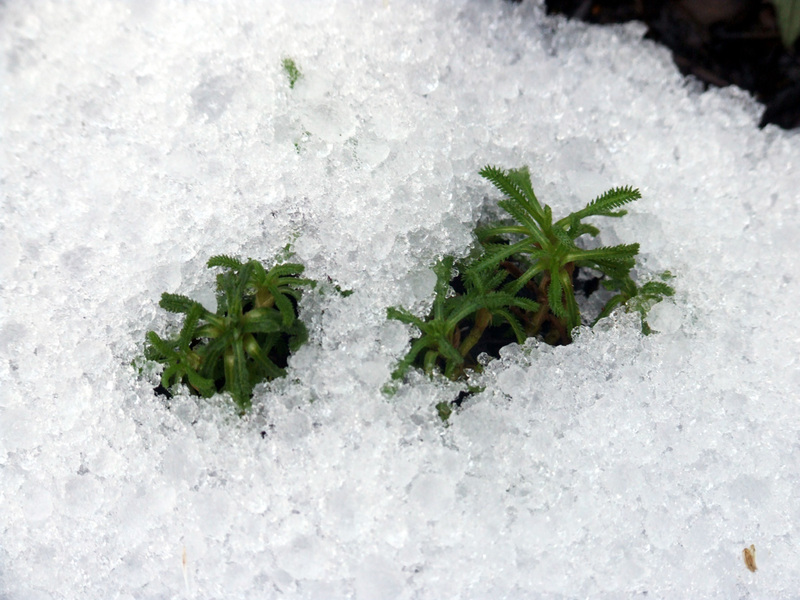 Despite the inclement conditions, our back garden is showing signs of precious life. Spurred into action by a mild December, most likely, and probably regretting it just a little now, but clinging on regardless. It’s Hama(mellis x intermedia ‘Diane’) time! 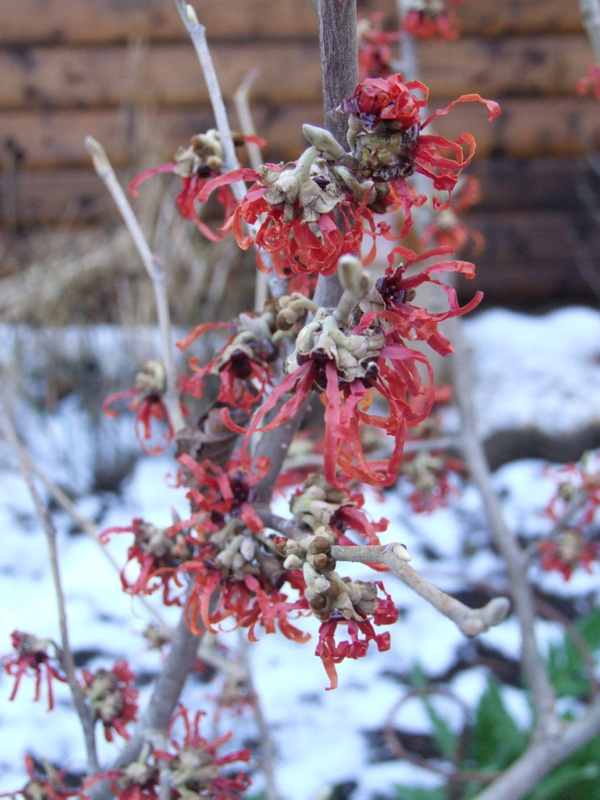 That’s our brand new Witch Hazel. We opted for the ‘Diane’ cultivar because we’re planning on planting a Cornus mas in the same area, which has similar-looking flowers in yellow rather than Diane’s deeper reds. Hopefully they’ll coincide at some point and provide a nice contrast to one another. 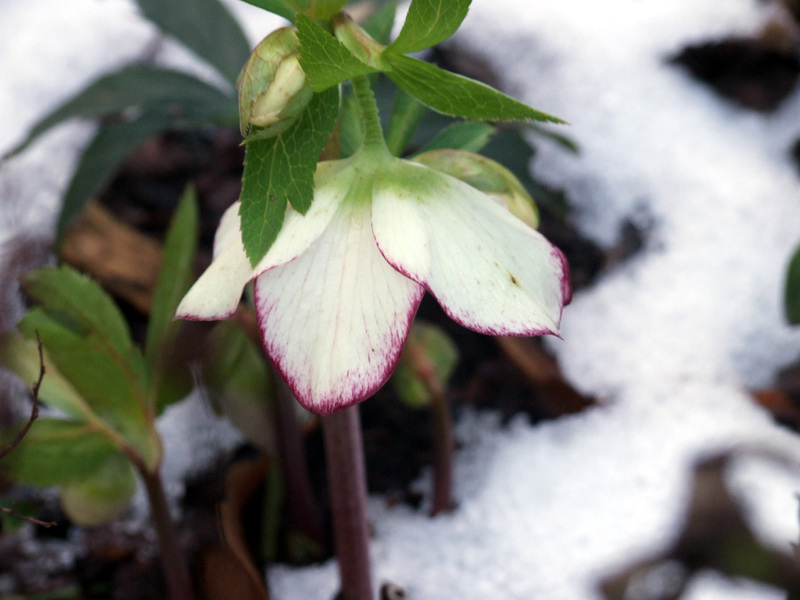 Helleborus nigra are amongst the earliest winter flowering plants to put on a display. 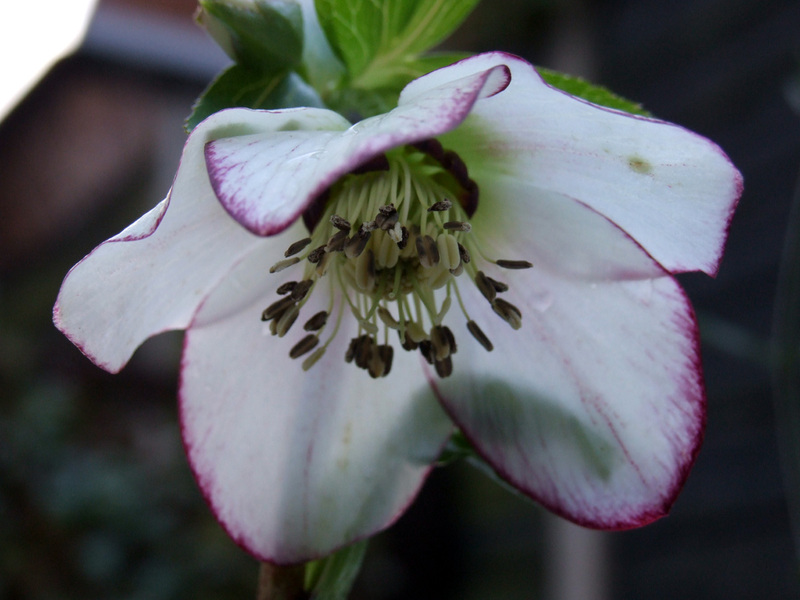 We rather enjoy this lovely Helleborus nigra hybrid with its picotee petal edging. We’re not sure whether this is one of the hellebore hybrids that we bought from Ashwood Nurseries a couple of years back, or one of our own hybridised seedlings. Jo has been collecting the latter from beneath their parent plants and carefully potting them up and nurturing them along. Either way, it’s particularly lovely, with that delicate purple rim on the white flowers. 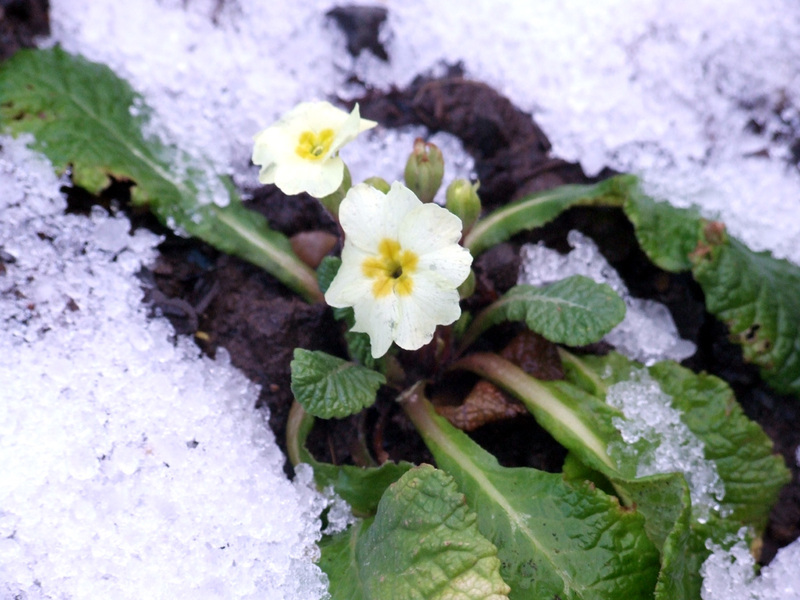 One newly-planted section of our back garden is liberally scattered with primroses. This one tentatively flowered during the mild December and seems to be weathering the worst that January can throw at it since. This Tulipa (?) 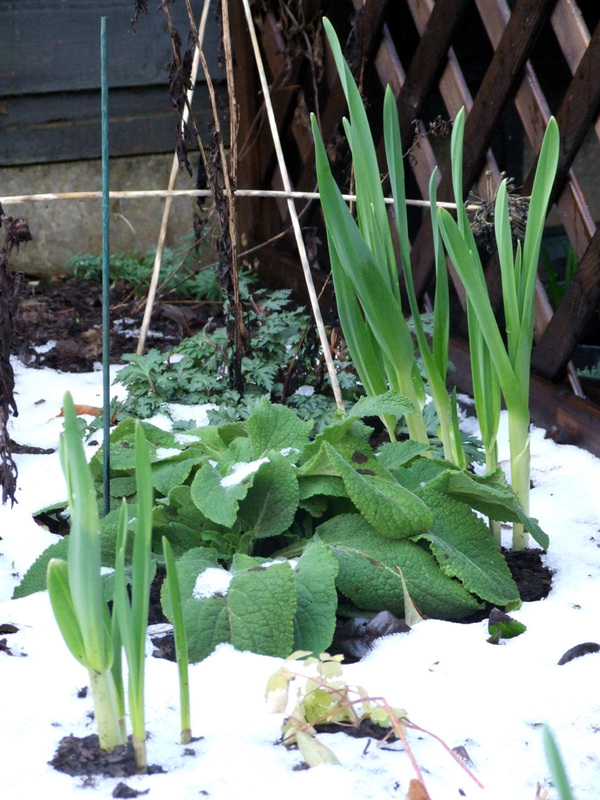 and Digitalis clump seems to be doing well despite the ice and snow. A fair fer bulbs and other plants started putting on fresh growth a few weeks ago. Let’s hope they’re not too badly frosted and knocked-back by the recent drop in temperatures.